Linwood Barclay initially caught my attention after I had been perusing "best of" book lists on Pinterest and saw that Trust Your Eyes was recommended as one of the "best thrillers that you can't stop reading." I couldn't find a copy of Trust Your Eyes at my local bookstore, but I did manage to pick up the only other title that was available, which was Fear the Worst. 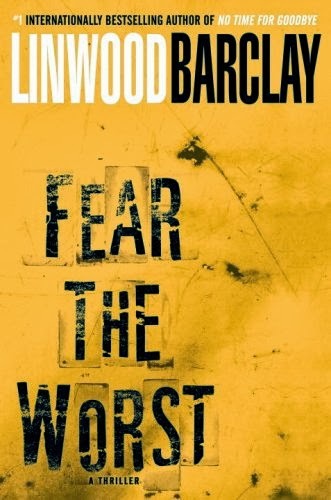 In Fear the Worst, Tim Blake - an average divorced guy who works as a car salesman at a Honda dealership - searches high and low for his teenaged daughter after she seemingly disappears without a trace. After having eaten breakfast with her one morning before work, Sydney never comes home after her shift at a local motel, and not even her closest friends know where she's gone. As Tim tears apart his small Connecticut town searching for Sydney, he realizes that some people have been lying to him the entire time, and he's got to step outside of his average suburban comfort-zone to locate his daughter before it's too late. The Pinterest user who included Linwood Barclay on their list of "best of" thrillers was definitely right on the money. Not only is Fear the Worst fast-paced, but Tim's character is hilarious and sarcastic. Here you have a fantastic story about your normal, everyday guy who's thrown into a maelstrom of violence and scary situations and reacts much the way you'd expect him to. The plot and Tim's character is reminiscent of Liam Neeson in Taken - but in a low-key, suburban-dad-without special-CIA-skills kind of way. I also love how Fear the Worst is written in first-person from Tim's point of view. I really commend Barclay on taking that risk with the story, because the result is highly-entertaining. From a mystery and thriller standpoint, the story is completely unpredictable, and I genuinely had no idea where it was going, which of course is always a major added bonus. I loved Linwood Barclay's style so much that I've added his entire backlist to my reading wish list. I even rush-ordered another of his thrillers so I could receive it in time for my New Year's Eve all-night read-a-thon. Linwood Barclay's latest novels include No Safe House, A Tap on the Window, Trust Your Eyes, and Never Saw it Coming. Have you ever read Linwood Barclay, and if so, what did you think? Who are your favorite thriller novelists? Share your comments with us below.